A young family’s house was ransacked by thieves – just two months after their home was seriously damaged in a fire. The residents of the property in Seaview Terrace, Joppa, were left devastated after the blaze broke out in their roof and spread to their neighbours’ house. Now it has emerged that the house in which the fire started has been raided by brazen thieves who loaded up the stolen goods into the family’s Peugeot Boxer van and drove off. It is understood that the thieves took mostly personal items from the terraced house, and attempted to steal a second van, which did not start. Homeowner Bruce Kidd, his wife and their two young daughters are believed to be staying with relatives while repairs are carried out. Police have launched a probe into the housebreaking incident, which follows a spate of break-ins and vehicle thefts across the city. Dedicated police drive Operation RAC has been set up to crack down on thieves known to force entry to homes and steal goods and car keys. Around one in six housebreaking incidents also involve a car being stolen and police have urged householders to keep their keys secure. Police have been conducting door-to-door inquiries in the hope of tracking down the thieves. Mr Kidd, who runs a firm which provides timing services for sports events, was not available to comment. The roof of his house is badly damaged and the windows and doors of the front of the house have been boarded up. Extensive work is ongoing to repair the next-door property, which suffered a collapsed roof. When the blaze broke out on February 18, stranded workmen from City Roofing Limited had to be rescued from scaffolding outside Mr Kidd’s home. Firefighters also evacuated several houses after strong winds whipped the fire into the house next door. The owners of the neighbouring house were away on a family holiday at the time of the fire. Neighbours said they had recently redecorated the home, and had only lived there for a few months. Speaking to the Evening News after the fire on February 18, Mr Kidd said his house had extensive smoke damage. Mr Kidd said: “I got a call from the fire brigade saying I should come home. I didn’t know what had really happened until I saw the black smoke from the road. 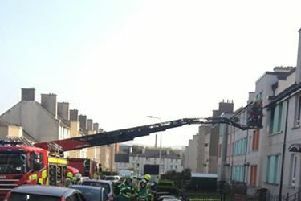 The Scottish Fire and Rescue Service has launched a probe to establish the cause of the fire, but it is not being treated as suspicious.